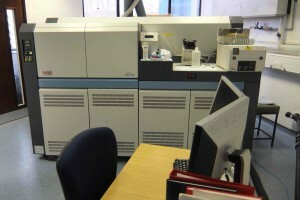 The stable isotope geochemistry laboratory hosted by CEPSAR at The Open University hosts Delta+ Advantage gas source mass spectrometers for the measurement of natural abundance stable isotope ratios in geological materials. The Delta+ Advantage is equipped with a Thermo Gas Bench II for high precision on-line isotope ratio determination of carbonate and water samples. We routinely measure bulk carbonate samples (~100 mg) for oxygen (δ18O) and carbon (δ13C) isotopes at precision better than ±0.06 and ±0.05, respectively. 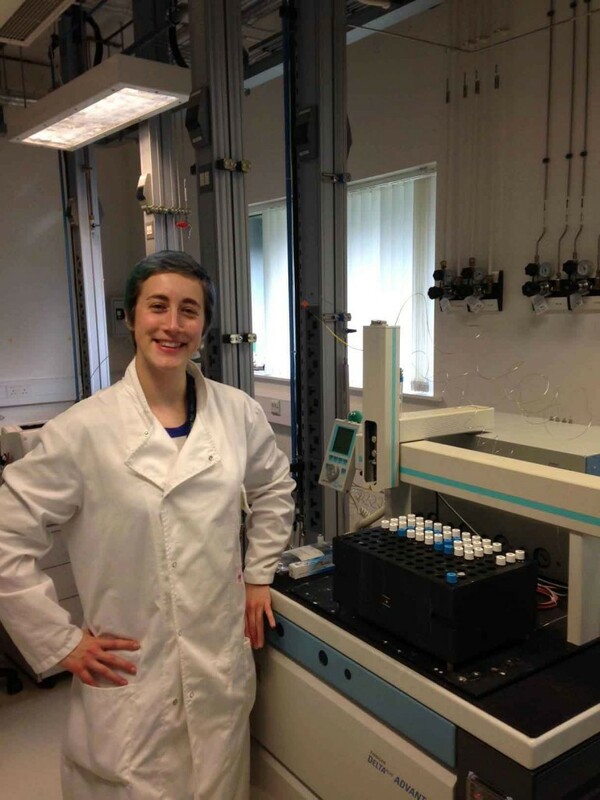 PhD student Kate Salmon using the mass spectrometer for carbon- and oxygen stable isotopes at the Open University. 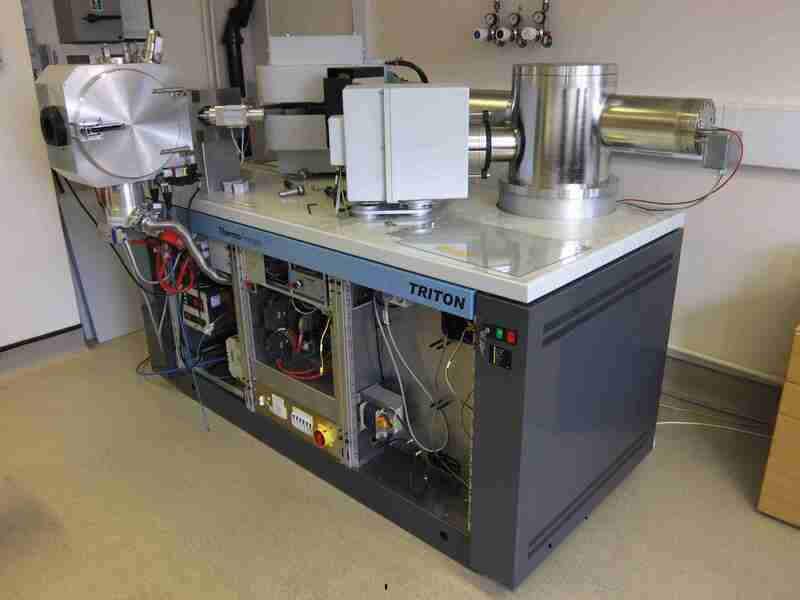 The team's research centre (CEPSAR) at the Open University houses two ThermoFinnigan Triton thermal ionisation mass spectrometers (TIMS). These instruments are the first of a new generation of high performance TIMS instruments. Within the palaeoenvironmental research group, we have a dedicated triton for the routine analysis of Os isotopes in sedimentary rocks for tracing palaeoenvironmental change. These analyses, pioneered at the Open University, enable past changes in global chemical weathering flux to be elucidated. The team's research centre (CEPSAR) at the Open University hosts a Thermo Scientific Neptune, a double-focusing multi-collector ICP-MS that enables high precision measurements of isotopic ratios. The Neptune is equipped with a Large Interface Pump that significantly increases sensitivity across the entire mass range and a wide range of isotope abundances can be analysed thanks to the secondary electron multiplier (SEM) used for measuring low signal intensities and the 9 Faraday detectors that can be connected equally to 1010 Ω, 1011 Ω and 1012 Ω amplifier resistors. Solutions are introduced in the plasma either via a Standard Introduction System (dual cyclonic/double pass quartz spraychamber) or using a Cetac Aridus 2 (PFA heated spray chamber coupled to a desolvating membrane). Analyses can be carried out manually or using a Cetac ASX-100 autosampler. Isotope ratios currently analysed on the Neptune for palaeoenvironmental studies include Li, Sr, Mo, Re, Pb, Nd and U. These measurements provide crucial information on the environmental conditions in which sediments were deposited.